Apparently, human longevity is something that a lot of people are willing to invest in. 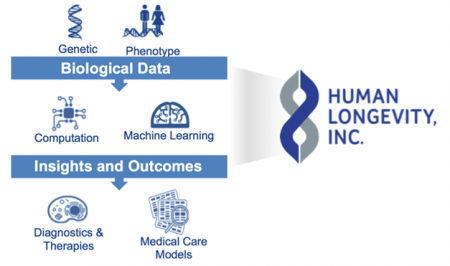 Human Longevity, Inc. (HLI), a company creating the world’s largest and most comprehensive database of whole genome, phenotype and clinical data, has completed its offering of Series B Preferred Stock, where it raised more than $220 million. It has previously raised $80 million in its Series A offering, which closed in Summer 2014. Those who took part in the Series B financing of the company include Illumina, Celgene, GE Ventures, and Series A investors from all over the world based in the United Kingdom, Malaysia, Mexico, Australia, Kuwait, Hong Kong, and China, in addition to the US. The money raised will go to HLI’s signature projects, including Health Nucleus, HLI’s genomic-enhanced health center; the HLI knowledge base (which currently has more than 20,000 complete genomes coupled with phenotypic data), the Comprehensive Cancer Program, and other sequencing programs.